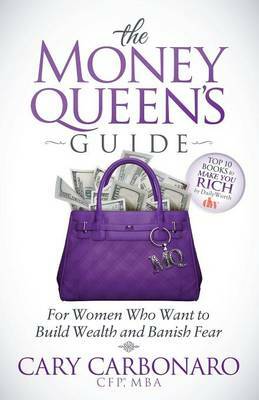 From your Roaring 20 s, to your Thrifty 30 s, and all the way to your (hopefully) Smooth 60 s, The Money Queen Guidewill work to guide you through each of these financial decades and provide insight and detailed guidance into the steps you can take, and the decision you should make to build a financially responsible future. Financial security is an exciting journey we can take together. So pack your purse and get ready for the ride . . ."
I am fortunate to have Cary as a colleague and friend. Her book is an inspiration to all women and a testament to her journey---you can befun, fabulous and financially savvy! --- Kathleen Grace, CFP, CIMA and Author of"Prince Not So Charming"
Cary Carbonaro has a way of making the complicated simple with the "Money Queen Guide. ---Susan Golomb"